I thought I’d be more nervous and get all tongue tied for my first speaking engagement, but I did okay. 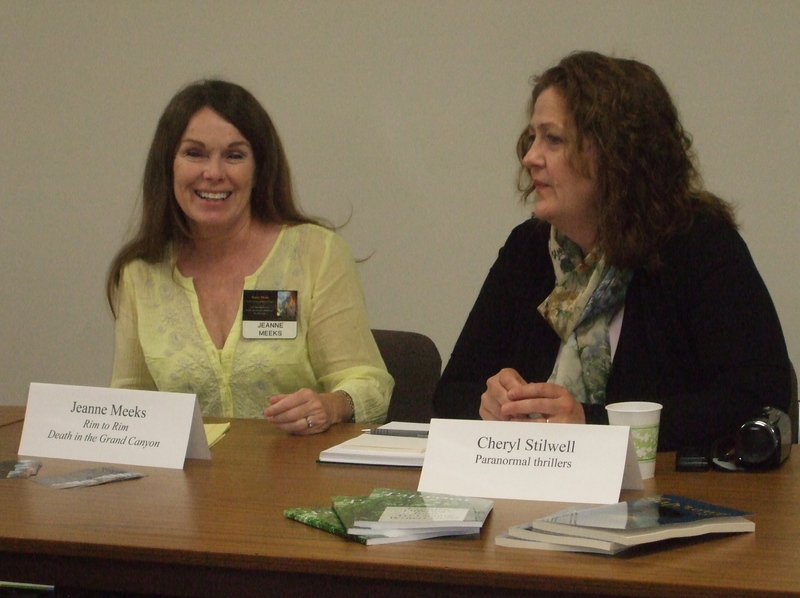 Our critique group, Southland Scribes, was invited by Oak Forest’s Acorn Library to speak about our books and the writing process. My first book, Rim to Rim, will launch later this year, so I figured I’d better get this marketing thing under my belt. To prepare for our debut authors’ panel, Murder and Mayhem, our seven members appointed the very talkative Helen Osterman, author of a the Emma Winberry series, as moderator. She “interviewed” each of us and kept the conversation going. Know Your Topic – Prior to the event, we suggested questions to Helen for the panel discussion. I thought about my answers in advance, but planned to wing it and be conversational. I rehearsed only the all-important elevator pitch and jotted down prompts, so I could nail it. Here it is: After her husband served her with divorce papers for her fiftieth birthday, Amy Warren tried to rebuild her self-esteem by backpacking across the Grand Canyon. She expected the trip to be difficult: heat, elevation, rattlesnakes . . . but spending the night trapped on a ledge with a murderous drug dealer came as a surprise. Make it an Event – Send out invitations and reminders and post on the social networks. Excite the audience by being excited yourself. Be happy. Laugh. Feed them. Lydia Ponszak, author of Who’s After Samantha?, arranged for coffee and goodies to be served. Welcome the audience at the door individually. Be a hostess. Dress for Success – If you look good, you’ll be more comfortable on display. Choose an outfit one step up from your norm. My 28 years in business taught me that a salesperson should show their clients respect by dressing at least to the level of the customer . . . to sell to a banker, wear a suit. 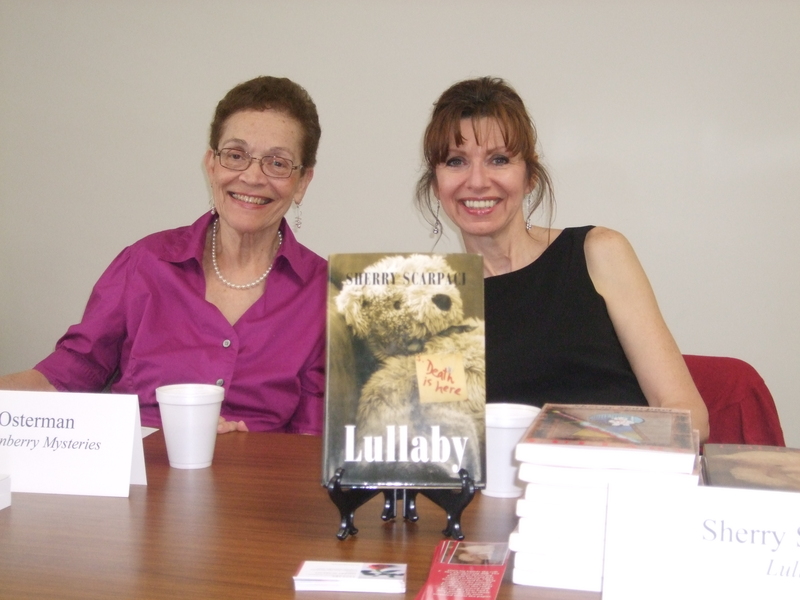 Sherry Scarpaci, author of Lullaby, wore a little black dress and looked terrific. Bring your Books to Sell – Our lively discussion went over the allotted two-hour time, but nobody left. The twenty-four members of the audience had been turned into motivated buyers. They wanted to see, feel, and buy our books. Sherry, Helen, and Lydia all sold books. Ryan O’Reilly, author of Scavengers and other short stories, only sells in the e-book format, but did a great job of promoting his work available on Amazon. Alas, my Rim to Rim is still at the editor, so I “sold” my website and blog. Visual Aids – Lydia set up a display table for our books, bookmarks, and posters. I printed tent cards to place in front of each speaker with their name and book title. I also set up my laptop with a slide show of photos from the Grand Canyon, hoping the audience will remember Rim to Rim once it gets published. Two weeks ago I put in a rush order for business cards featuring my new domain name and a cool photo from the canyon. The other authors had bookmarks to distribute and little tripods to prop up their books. Speak up. Put Yourself Out There No one can market you better than you. Force yourself to talk about your book. Start conversations with your potential readers. Shake their hands. Tell about your characters. Push your business card or a bookmark on them. Ask them what they like to read. Helen is an excellent promoter. No matter the topic she links it to one of her books and endears herself to the audience with her laugh and humorous stories. Remember, the audience wants to be your friend and, of course, speak loud enough so the person in the back row can hear you. Expand your network by asking attendees to put their name and e-mail address on a list at the door. 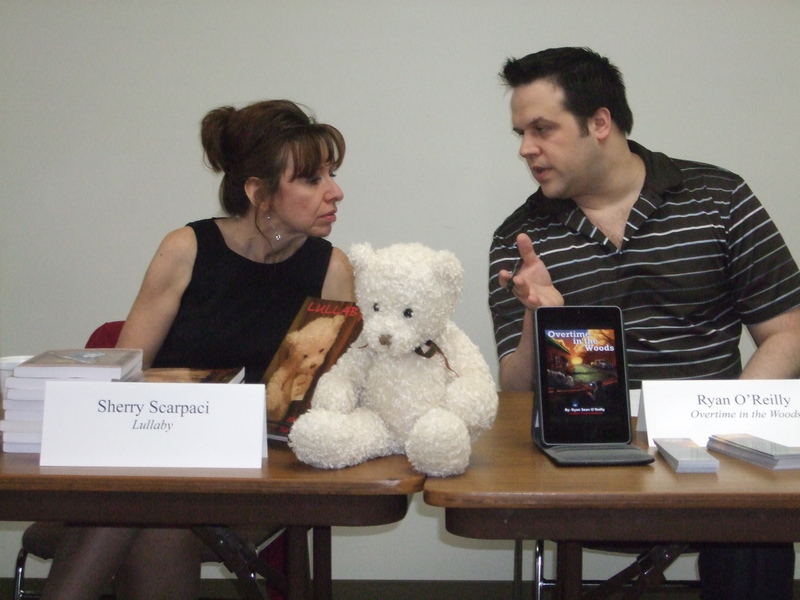 Use that info to notify your new fans of book launches and up-coming events. Everyone loves getting something for free, so each of our authors donated a book for a raffle. The audience participated enthusiastically. Lydia asked a young boy to pull the names, and he gave us a laugh when he picked his own name first. Ryan announced that his latest story, Overtime in the Woods, was available for free on Amazon for a short time. He is building his name recognition and sells other titles after giving one for free. I’m going to follow his model. Attendance to the panel discussion was free, but most importantly we geared the event to give the audience value. Many were aspiring writers, so we gave them information, contacts, and the benefits of our experiences. For example, Helen and I just learned how to use QR codes and passed that knowledge along. Selling books happened as a sideline. I loved my first speaking engagement and came home invigorated and ready to write another novel. ‹ PreviousWild Food – Ramps. What’s a Ramp? Thanks, Ryan. We’re all learning from each other. Informative article! Great blog Jeanne. The panel was a great experience for me too. It was really my first time doing something like that. We had a nice turn out, good questions, great speakers and an outstanding moderator. You did a good job presenting yourself in a professional matter and having “stuff” available for people to get to know you before you book even comes out! I think that’s huge. With the way the book market is these days you can’t sit back and wait for success to come. You have to go out there and give it your all. So kudos to you for all you’ve done alreays!